The exterior of the g-club series is comprised of a strong nylon normally found on hi-end luggage. Proof that some thought went into the g-series bags is the fact that all clasps and buckles on the straps are made of steel, not the "nylon" or plastic that is seen on some lower quality bags. Plus, all straps are double cross-stitched and riveted where they attach to the bag. In the bottom of the bag is a thick rubber cushion to protect things when you have an, “oops” moment. Upon opening the Gator g-series, you are treated to a trendy bright orange padded interior that offers up great protection for your gear. The G-Club CDMIX 12 has removable and repositionable pads that allow versatility when it comes to the types of gear you can pack inside. The G-Club CONTROL, Gator's midi controller bag, has an interior equipped with an egg-crate foam on one side that surrounds and protects any knobs that your controller might have. 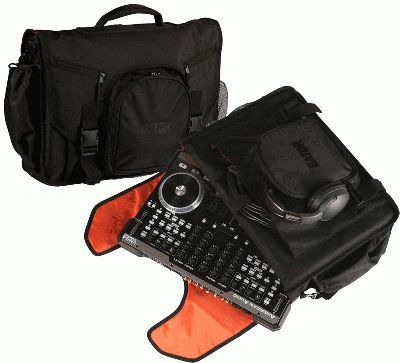 Both bags feature convenient pockets on the front for headphones and all kinds of pockets for cables and connectors. All the seams on these bags are well sewn with the end runs tried right and hidden. Two things we really liked were the thick padded handle and shoulder strap and the padded outer backside of the bag (the side that goes up against you when you carry it) was covered in a softer nylon, making it not only more comfortable to carry, but less wear on your clothes. Like those old commercials where the gorilla throws the bag around the cage, we also take things to the extreme here at the DJzone bench. We could not afford a gorilla and didn’t want to have the animal rights people breathing down our throat, so we decided to do it our way. We attached a G-Club DJ bag to an overhead truss and swung on it. After loading it down with over 250lbs (watch the video), or ten times the normal weight of any equipment you may carry in them, the shoulder strap held up. Then we ran the old Dremel grinder test to see if the bag would withstand a bit of wear. Of course the grinder ate it up a bit, but when it made it to the rubber bottom it choked. Very cool. Gator has more than met and exceeded our standards when it comes to providing djs with a strong yet lightweight portable way to haul their equipment around. The G-Club series of bags is not only a highly stylish and durable solution; it provides the complete lightweight alternative to a hard case without sacrificing protection.